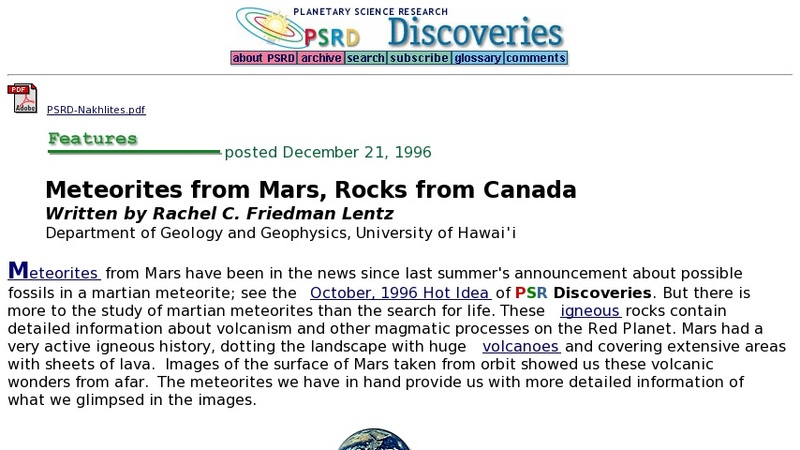 This site from the University of Hawaii's Planetary Science Research Discoveries compares rocks from Theo's flow, an unusually thick lava flow in Ontario, to nakhlites, meteorites from Mars. The author believes that the geochemical and petrologic similarities between the meteorites and rocks from the center of this flow demonstrate that nakhlites could have been derived from an extrusive lava flow on Mars. Photographs and diagrams help illustrate the concepts and the text has embedded links to a glossary of terms.